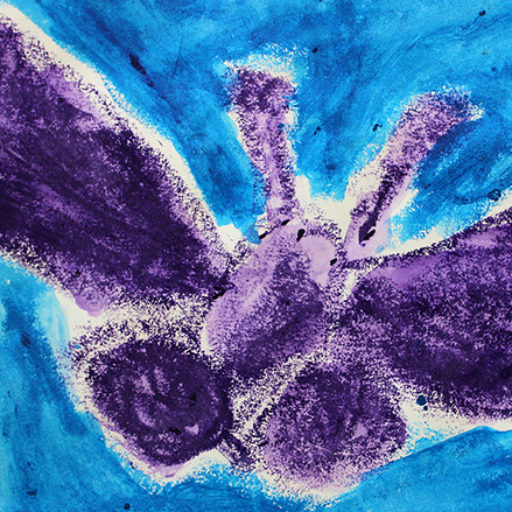 On the way to her classroom one morning, five-year-old Honor saw some birds in a Kindergarten classroom. She asked the teacher with her to take a picture of her with the birds, but there was no camera available. So Honor came up with a plan to get that picture. 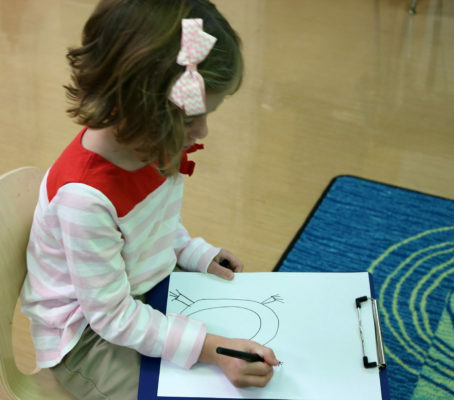 Once in her own classroom, Honor drew a picture of a bird on a little card, presented it to her teacher and told her it was for the calendar, to mark the day when she could go to all the classrooms in the building and take pictures of the classroom pets. Honor and the teacher talked about Honor’s idea for a while. 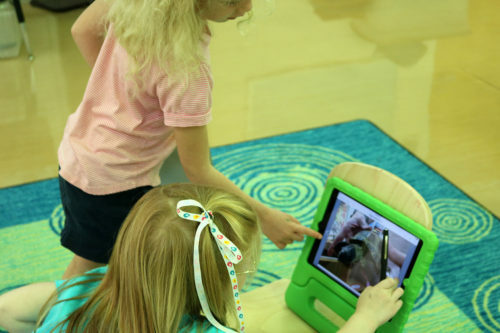 Through an exchange in which Honor would propose her vision, the teacher would respond with regulation (this is possible instead of that idea that would be exclusionary or disruptive, for example), encouragement and tools/technology. Then Honor would add to the plan and the exchange continued, until they eventually agreed that this could be a collaborative project, that the pictures would be taken with iPads, they would make an eBook with them and that the project could start that very day. Honor made this card for the calendar, intending to mark the day when this project was going to happen. At Morning Meeting, Honor presented her idea to the class. As the children discussed the proposal, there emerged a conversation about what constitutes a pet, a distinction that had to be made a few times in the course of work on the project. Do class pets usually have dresses? No? So what’s the difference between a plant like a flower and an animal? Does (classroom therapy dog) Lucy have horns? No? Then is she a flower? Honor solicits four friends for the project group. Honor records group members’ names. The clipboard and recording of group members’ names were her idea. The “5” represents the number of group members, negotiated down from 10. 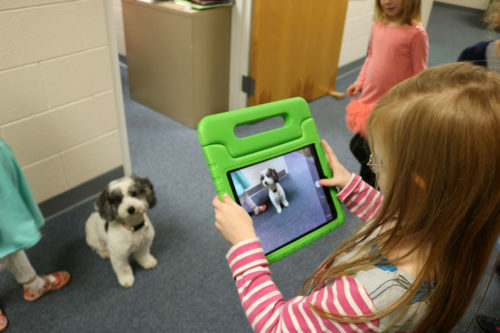 After Meeting, the project group set off with an iPad to answer the question, “What class pets are in the Lower School?” and to document their findings. 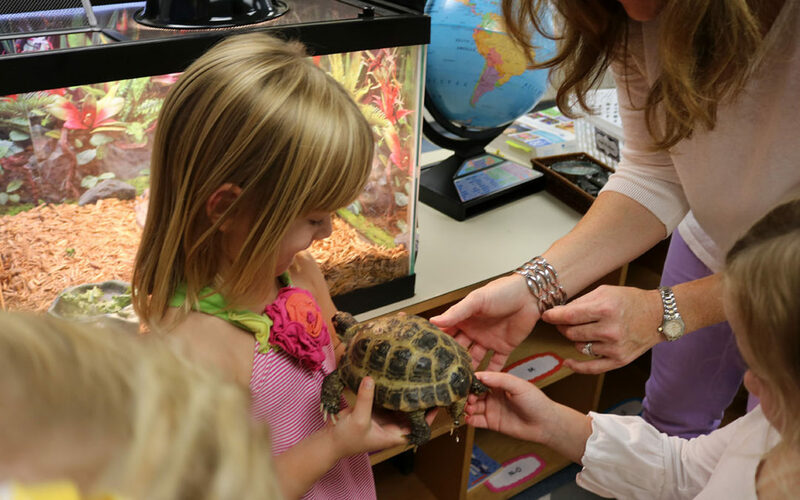 In one second grade classroom, the children met “Shelly,” a Russian tortoise. The teacher graciously took Shelly out to visit for a bit. Honor documents with the iPad the group meeting Shelly. 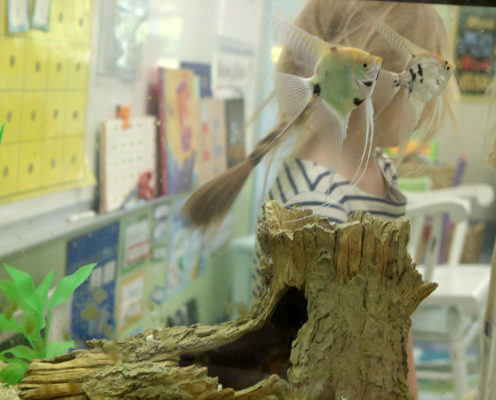 In the same classroom were angel fish, which the children got to feed. 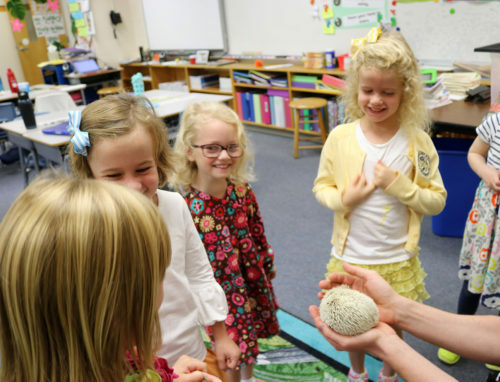 In a third grade classroom we found Pixie the hedgehog, whom the children thought was both funny and scary. 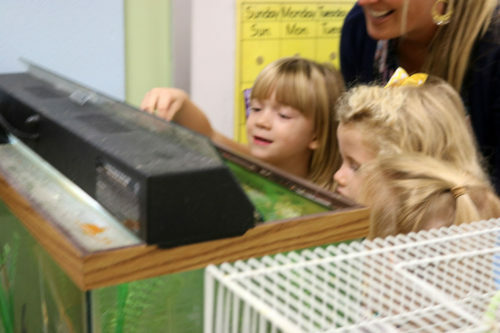 In the Science Room the children found fish and a chinchilla. Photographing some of the fish. The children’s understanding of “pet” was challenged by two teachers on our visit. 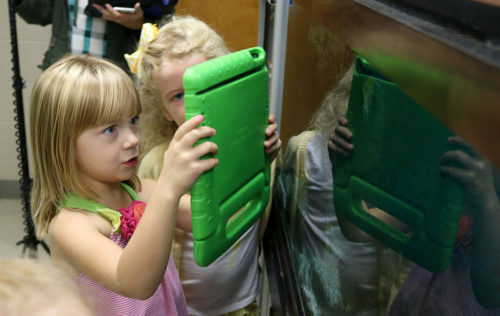 One fourth grade teacher told them that there were pets in the classroom and presented three stuffed animals with names. 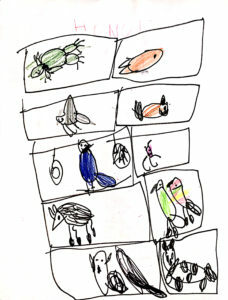 Even though the teacher and students in that room identified the animals as pets, the JKers decided that no, the stuffed animals did not meet their criteria. 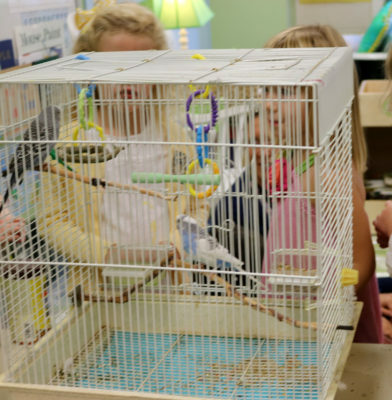 Then, when the children visited another fourth grade class and asked if they had any pets, the teacher said, “Yes,” she had pets and began to name the students in the class. That gave the JKers pause. The people were alive, they can move, they can do all the things the children had said pets can do. But after a bit of hesitation, they dismissed the joke (I don’t think they thought it was funny at all) and explained to the teacher that people cannot be pets. 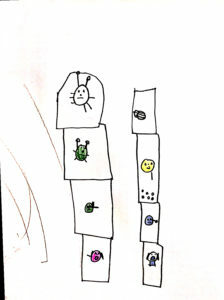 The children visited all the classrooms in the building, documenting the pets they found. 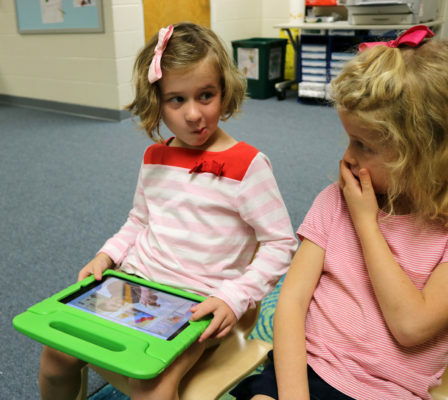 The project group had stated that they wanted their classmates to be able to read their iBook. In response, we offered them an app that would allow them to record captions for their photos, limiting the text in this September-generated book. It’s I’s turn, but I. isn’t sure what to say (or is self-conscious). H. is advising her, but I. seems doubtful. The consultation seemed to give I courage, though. In the end, she said what she wanted to say. 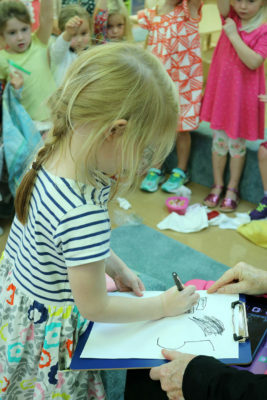 When the recording was finished, the group set out to draw pictures for the cover of the book. They used their photographs as referents. The children used photographs that they took themselves as referents. The children realized at one point that they didn’t have pictures of their own class pets, a pair of finches and Lucy, our therapy dog. They revised their eBook to accommodate their additions and declared the book ready for publication. 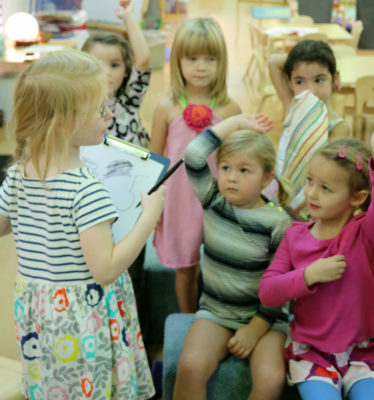 Years and years ago…so long ago I can’t find the reference any more…I read in Lilian Katz’s work the question, “What’s being learned here?” Throughout my development as a teacher, I used the question as a guide, a mirror and a boundary. If I asked of myself “what’s being learned here?”, it helped take me right to what really mattered. Two children in conflict? “What’s being learned here” helped me stay focused on the opportunity for learning for both children. If I wondered whether certain materials were worth replenishing, “What’s being learned here?” helped me discern their value at the moment. And if I were asked to support my pedagogical philosophy, answering the question, “What’s being learned here?” was all that was needed. 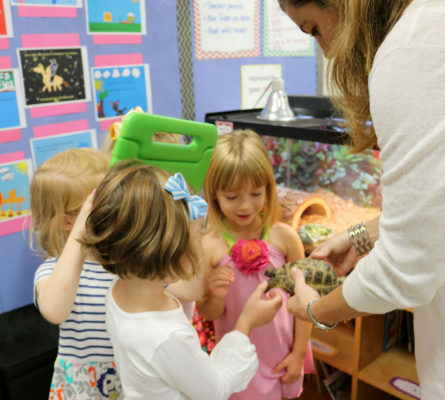 Through the Class Pets project, initiated by one child through her desire to know more about something, five five-year-olds engaged a number of dispositions toward learning, skills and understandings. It’s what was being learned. 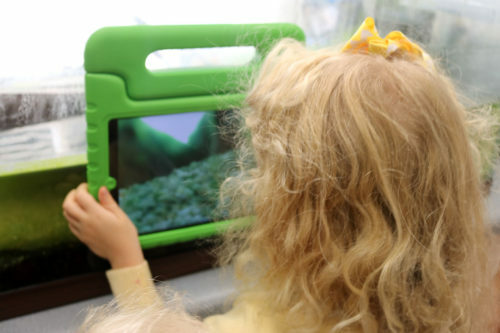 The children gained experience and found pleasure in collaboration, shoring up the disposition toward collaboration and acquiring the skills of working with others toward a shared goal. They worked on finding their voices with adults they did not know, articulating their project, asking if there were pets in the classroom, asking questions about the pets and even arguing with a fourth grade teacher that students are not pets. They deepened their understanding of the definition of “animal” and the criteria for membership in the animal classification. 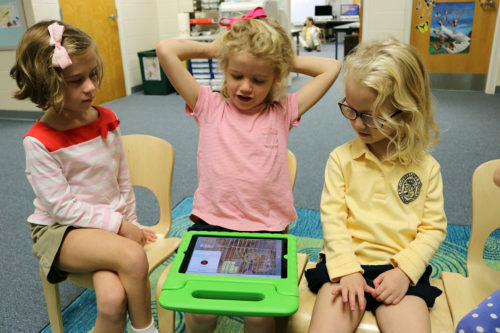 They experienced the documentation process and learned how to use an iPad and an app to do it. Taking photos and recording captions or stories became a regular medium for the children, who taught the others in the class how to do it. They developed their sense of agency. That is, they saw that their opinions, plans and ideas were important to group process, which encouraged them to pose them again and again and to expect that they will be able to make their ideas visible if they just try. They studied through drawing the pets they saw, using their photographs as referents. 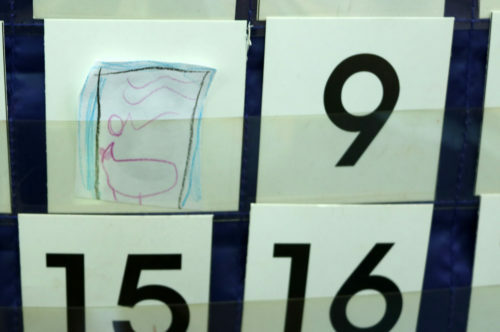 This was an early exercise in symbolic representation, which they practiced in various ways for various reasons all through the year.